You can render alarm into any Active Area. 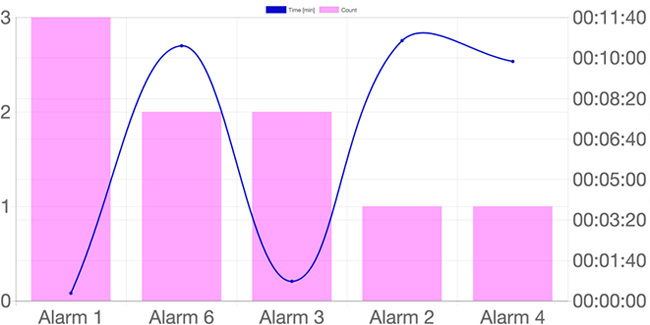 Same way as you generate aggregated alarm table, you can create aggregated alarms chart. With the first parameter object you can specify a filter to use on online alarms, second is a callback function to get the data. To use this function, please use a visual dialog located in the editor top bar. First parameter is config object and second is the callback function which is called after data are available. To use this function, please use a visual dialog located in the editor top bar. First parameter is message into the alarm log, second is the options object allowing you to specify filter of what type of alarms should be confirmed and last one is a callback function which is called after the function is processed. Filtering alarms can be done by following parameters: alarmIDs, severityMin, severityMax, area, message, device. Note: Only alarms active at the time when this function is called will be confirmed.